The eleventh annual Sinkankas Symposium was held on April 6 at the GIA World Headquarters and The Robert Mouawad Campus in Carlsbad, California. We received the following testimonial regarding the conference and thought we’d share it with you. 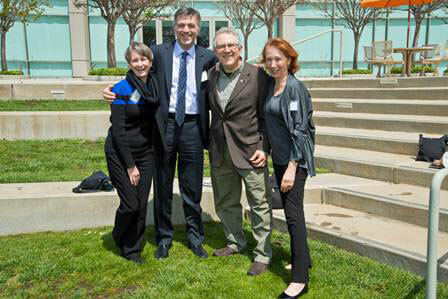 This was my first time attending the Sinkankas Symposium held at the GIA campus in Carlsbad. 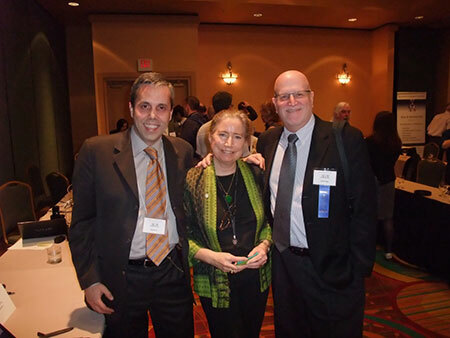 I decided to attend flying out from Chicago with no other purpose or business other than to attend the conference. I was thoroughly impressed. 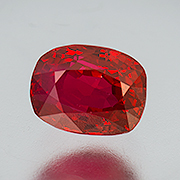 The single stone format, this time focusing on only ruby, offered attendees the opportunity to learn multiple aspects on this gem. We learned about sources, color, mineralogy, faceting, and even photographing rubies. There was something for the scientists as well as the collector. The photographs in the presentations and the conference book were spectacular. I commend Roger Merk and his staff of supporters for a fine one-day conference, well worth my attention and my attendance. Richard told us that he will include an article about the symposium in the next edition of The GemGuide, which will be published May 1. 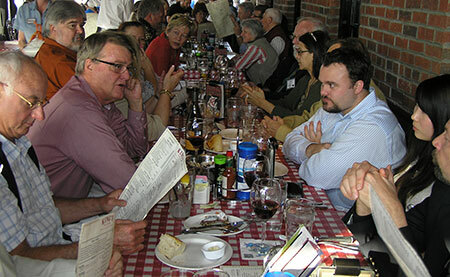 If you’re planning to attend the ICA Congress next month, you’ll need to sign up for the post-conference tour by April 18. The tour, May 18–25, takes place in Hunan Province, beginning with a visit to the Yaogangxian mining area, then Shizhuyuan (one of the largest fluorite deposits in China, amongst other minerals), Xikuangshan (world’s largest antimony deposit), Chatian (luscious cinnabar), and more. Can you pick out the ruby and spinel? 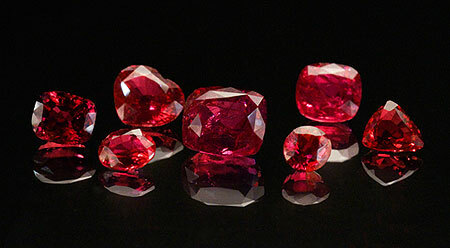 Throughout history ruby and spinel have gone from being considered the same gem, to ruby’s great rise as a precious stone and spinel’s fall in association with synthetics, on through to ruby’s continued ascent as one of the earth’s rarest and spinel’s attempt to find itself amongst the elite gemstones. 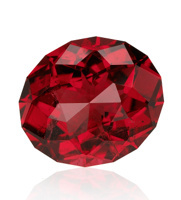 Ruby, of course, was one of the original gem varietals recognized by the first collectors of jewels, even categorizing spinel as a ruby simply because of its red hue. The foundation and provenance of ruby is ingrained into modern adornment, while spinel has waited patiently for its rise. Spinel has exploded onto the gem radar over the last few years as one of the next great collectable gems. 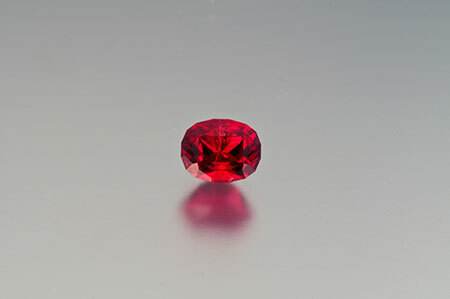 One dealer described this rise as the pricing/value gap shrinking between ruby and spinel, by means of spinel gaining ground on ruby’s dominance. Both have seen immense increases in value for larger, finer, completely natural varieties. 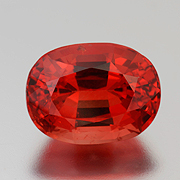 In some cases it’s harder to source large red spinels than it is to find large rubies. The relationship between ruby and spinel runs deep and they continue to evolve together and separately in unique fashion. 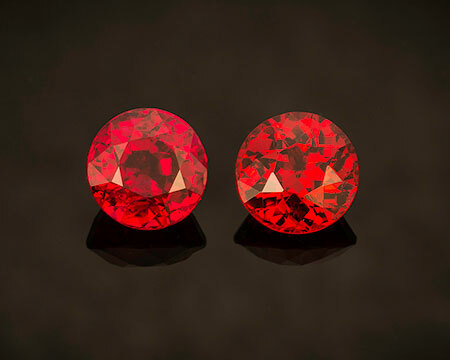 Colors for ruby and spinel can overlap with a myriad of secondary hues, which give each stone a unique look. 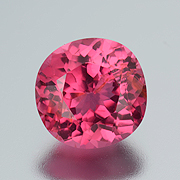 Fine ruby and spinel average in the range of 70–80% red and the remaining percentages can be filled in with pink, purple, orange or a mixer. Ruby still holds the most pure red the eye can perceive, in the “pigeon’s blood” realm, but in some cases spinel isn’t too far behind. 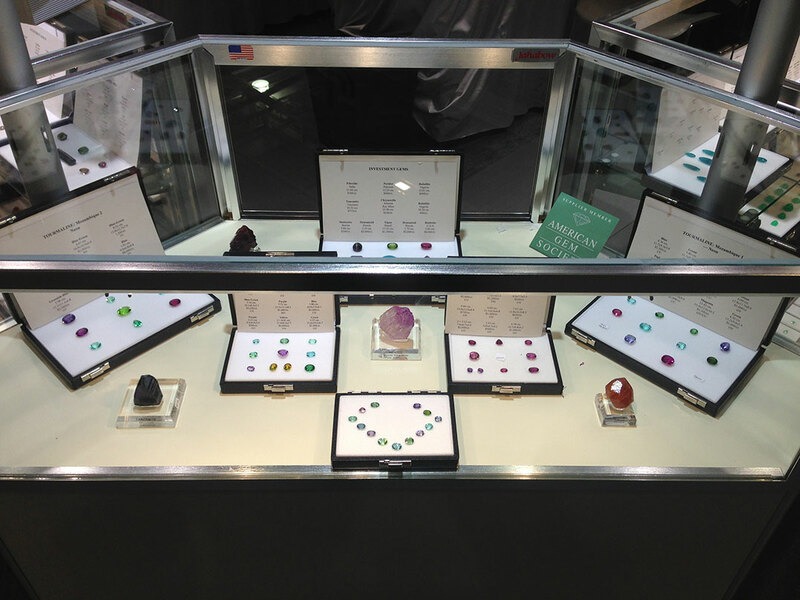 What do you do with an award-winning colored gemstone? In the case of Lisa Elser, recipient of a 2013 AGTA Spectrum award for a 14.24-carat Nigerian red tourmaline, you give it away. But not just to anyone. 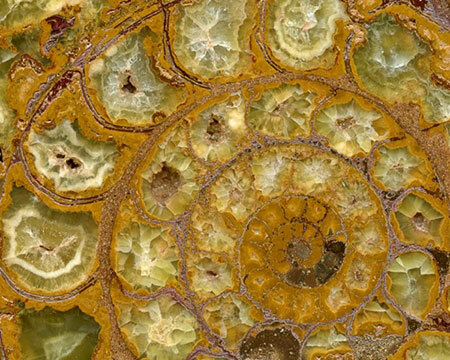 This gorgeous stone goes into the permanent collection of the Smithsonian Institution. Lisa Elser – Custom Cut Gems, a firm based in Vancouver, is no stranger to giving. Elser and her husband Tom Schlegel buy rough material at the source, then donate a portion of their profits to support economic development in those same gem-producing countries. Elser trained in cutting in Montreux, received her GG from GIA, and became a full-time faceter after years as a hobbyist, allowing her to retire from a career with Sun Microsystems. 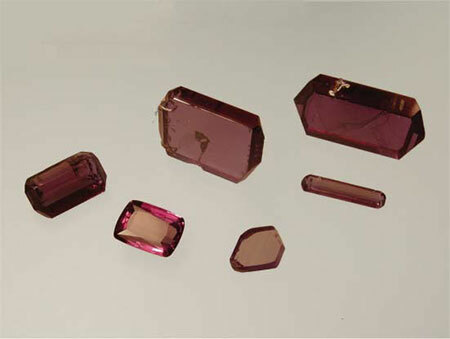 Schlegel, who engineered the tourmaline’s design, is a research mathematician, using his knowledge in gemstone creations. It was their work at Sun that originally took them to Southern Africa in 2000, and they fell in love with the region and its people. 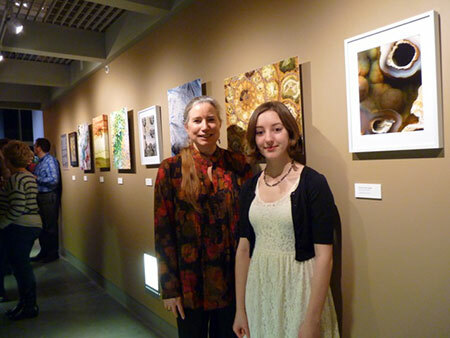 For details on the couple’s “give-back” efforts, see this article from Coquitlam Now. The death of Victor Carranza marks the end of an era, the end of Colombia’s “emerald czar.” The story of Carranza’s dominance starts with prospecting near the Chivor mine, in central Colombia, as a young boy and discovering an emerald deposit of his own. He parlayed this entrepreneurial quest as he began to buy property and ultimately became one of the biggest land owners in the country, involved with the most famous emerald deposit on the planet—the Muzo Mine. Regarding his affinity toward the green jewels he said, “The emeralds follow me,” and he proved to have quite the innate sense of where they could be found, even spending time underground mining on the front lines. During Carranza’s reign he had to wrestle with rival families, militias, and even the Medellín cocaine cartel, but somehow managed to hold his ground. Word in the emerald community is that possible successors to Carranza are not as well equipped to handle the power he amassed. Some of these characters are tough and not willing to negotiate. This could create a very volatile environment for the emerald trade in Colombia. We can only hope that some of the ruling families can explore some civilized means to sort out the power. 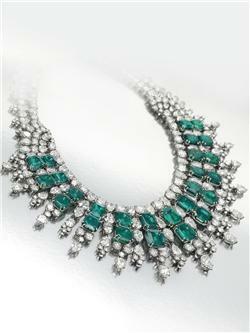 Emeralds have definitely seen substantial appreciation in the last few years along with most other gem varieties. 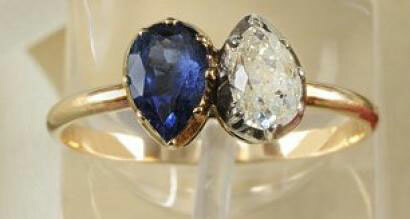 The upper-echelon stones of rarity, size, and non-treated nature have seen the most dramatic increases. With this change in power of the main emerald conduit, we expect to see prices rise even more. 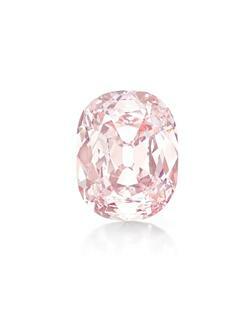 Christie’s New York announced yesterday the sale of a 34.65-carat Fancy Intense Pink diamond—the “Princie”—for $39,323,750. It hails from the Golconda mines of south central India, and is the most valuable diamond from that locality ever to be sold at auction. It also is the most valuable diamond ever sold by Christie’s. The diamond was in the possession of the rulers of the princely state of Hyderabad (home to Golconda), and first was offered for sale at auction in 1960 by the Nizam of Hyderabad. 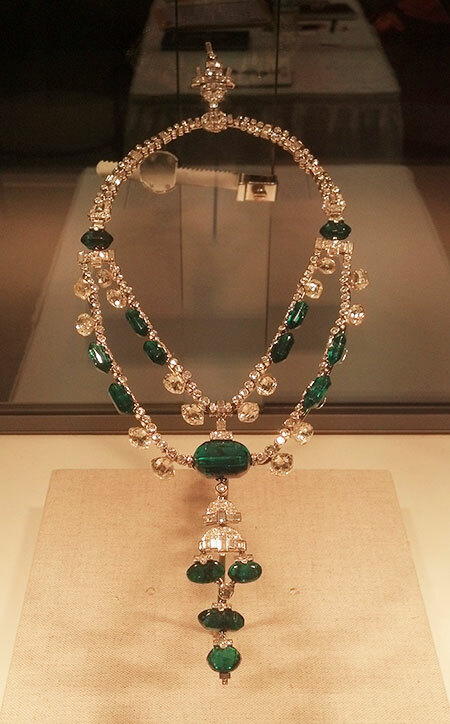 It was purchased by Van Cleef & Arpels for what would today be $1.3 million. At a party in the firm’s Paris store, the diamond obtained its moniker in honor of the young Prince of Baroda (another princely state in India), who was in attendance with his mother, Maharani Sita Devi. Traveling in style. 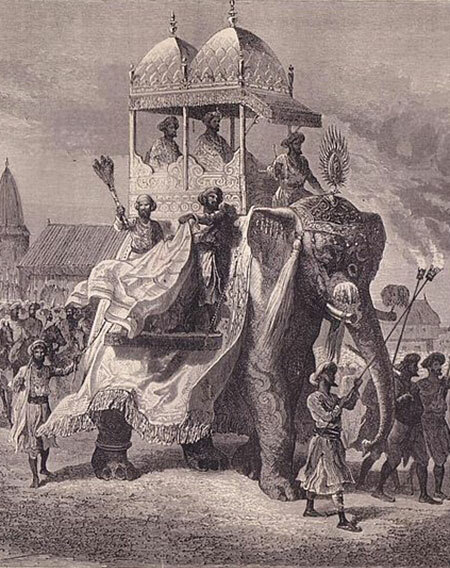 The Baroda king in a great procession, detail from an 1870s engraving. As Pala’s webmaster, I’m excited too. Thirteen years ago, my brother Richard W. Hughes, together with some local programmers, gave Pala its web presence, revolutionizing Pala’s inventory system in the process. Mineral Manager promises to provide us with v.2 in that evolution. Our current upload-to-web procedure requires a series of steps that often is hampered by a fickle (albeit T-1) Internet connection at Pala’s picturesque, but secluded, location. The procedure also uses an on-site database that can’t easily be accessed from afar. 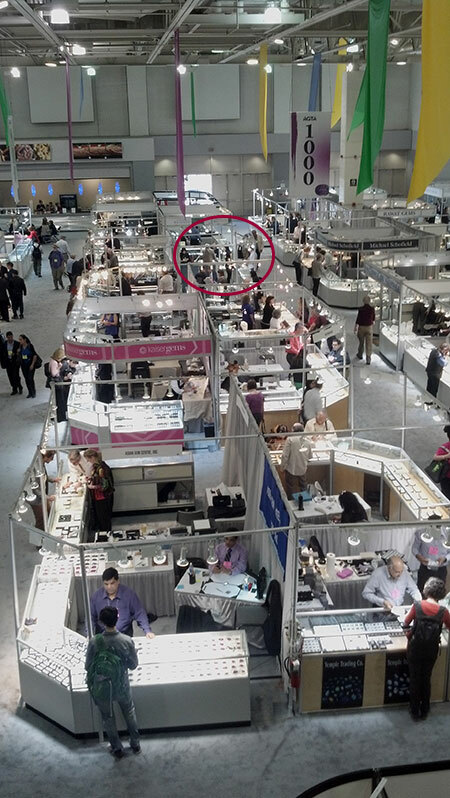 Mineral Manager, which is hosted on Amazon’s expansive and secure cloud, will allow us to, say, acquire a stunning spinel at the Tucson GemFair, take it to Jeff Scovil for imaging, and have it online within a matter of minutes or hours. And there’s no lag time between data entry and web publishing. Mineral Manager will replicate our current components: inventory management, contact management, point of sale and client invoicing, mobile credit card payment processing, consignment payment processing and reporting, all with Mac (and PC) compatibility. But it also will replace our newsletter emailer, for which we pay a subscription fee, and it will replace our web hosting (a host we grudgingly went with when our original, local host was bought out). Mineral Manager offers website templates, blog (and such) integration, financial and contact reporting, and integration with QuickBooks. Collectors also will be interested in a 400-specimen version with special pricing. Visit Mineral Manager here. 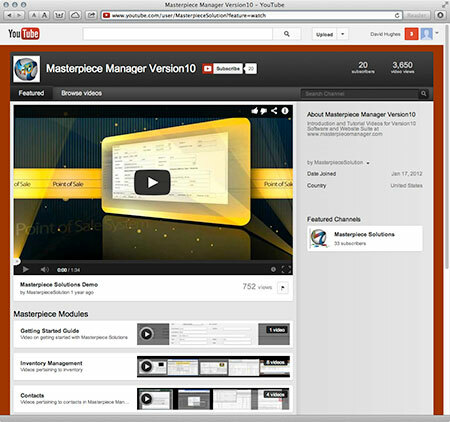 You can get a sense of how Mineral Manager will operate by viewing streaming videos on YouTube of its sibling, the gallery solution Masterpiece Manager. Even as the Burma government had transported its troops into the jade land of Hpakant ahead of April 10 talks with Kachin Independence Organization reps, as reported by Kachin News Group, the talks were postponed. Democratic Voice of Burma wrote on April 9 that the decision was “mutual” due to time constraints. Apparently China, which also is slated to participate, objected to international observers. Don’t know how we missed this one, but a recent story in Myanmar Times mentioned a 2007 discovery of a unique artifact of international diplomacy—circa 1756! It’s a gold-leaf missive from Burma’s King Alaungpaya (1714–1760) to Britain’s George II (1683–1760) on a topic that’s almost irrelevant; it seems George couldn’t read the letter and had it sent to the library of his home town in Hanover, Germany, where it surfaced six years ago. The letter is composed of gold leaf, 55 cm by 12 cm, with each side adorned by twelve cabochon rubies. Twelve lines in the Burmese language give permission to British merchants to remain on Hainggyi Island, with hopes that dealings between the two countries would improve. Signed, sealed and delivered—and forwarded. 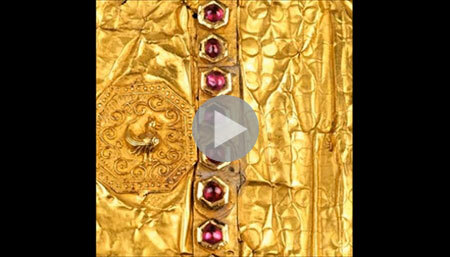 See a two-minute streaming video providing background about the gold-leaf letter. 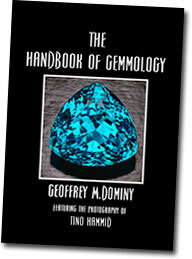 Vancouver-based Geoffrey Dominy has just released a digital-format book, The Handbook of Gemmology, featuring the photographs of notable photographer Tino Hammid. Why digital? “Tino and I chose to make our book digital for one reason and one reason only,” Dominy explains, “to make it affordable.” Indeed, a 650-page hardcover book would retail for $200 if not more. The digital format, for as little as $39.95, puts it in the hands of students, who can benefit from the information. As Dominy writes in his preface, during his own pre-Internet study for Gem-A courses, “I did find there were certain areas, namely crystallography and chemistry, that were somewhat lacking. … I was left at the mercy of the public library pulling my hair out trying to make sense of concepts that seemed beyond comprehension.” If only he’d had an e-book to study. While we’re on the topic of the format, it bears explaining that such a format may not be for everyone. The book won’t render nicely on a laptop or tablet. Even on a 20-inch monitor, the default resolution leaves the text slightly distorted in the “.app” version we reviewed. (It also comes in three other formats; spend $10 more and get all four.) But then again, you don’t read two pages at a time, so simply tap the middle of a page to enlarge it. And you can enlarge quite a bit before images become pixelated—something you can’t do as easily with a hard-copy book—allowing for nice detail in the illustrations. You can mark up your virtual book with notes and highlights, something you’d be loath to do with a $200 book. And, of course, there is virtual bookmarking and—most useful—searchability (in addition to a traditional index that unfortunately is not hyperlinked to targets, but is printable). A typical spread. Navigation and such are handled by controls at the top and bottom of the window, settings at the left side. Below, the same page is bookmarked (green), notated (yellow), and highlighted (violet). Moving on to the content, which begins with a basic question, “What is a Gemstone?” and differentiates a gemstone from a “mineral” and a “rock.” This is followed by a discussion of gemstones’ chemical nature, properties (physical, chemical, optical), and some basic crystallography. 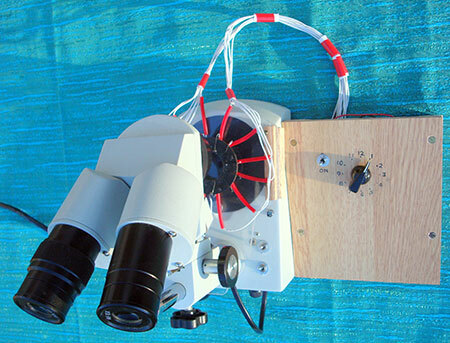 Light is handled next, including absorption and spectroscopy; the 3 R’s (reflection, refraction, refractometer); polarized light and the polariscope; and pleochroism, the dichroscope and color filters. Specific gravity and luminescence are next. Now, the first of several sections of eye candy (not that the other sections are short on lovely images), as part of a look at magnification (and thermal conductivity), which is followed by 24 illustrations of inclusions. Next, imitation and assembled stones are covered, followed by synthetics. (I know that this last chapter would have been useful in regard to our look at Dr. Karl Schmetzer et al.’s work on flux-grown alexandrites in February.) Again, this chapter is accompanied by many photomicrographs. 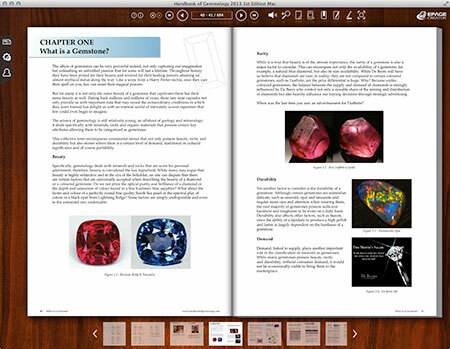 The book is rounded out by more than a dozen chapters on gemstone identification, mostly grouped by color, for one-stop shopping. Amongst these chapters are discussions of natural, cultured and imitation pearls as well as advanced gem testing techniques. Appended… are eleven appendices, including lists of gemstones by refractive index, specific gravity, etc., and some quick reference guides. There’s an impressive amount of information provided by Geoff Dominy—all in one place and with ease of access. Such a book as this likely wouldn’t be read from cover to cover even as a traditional book, so the format seems perfect. It’s the sort of reference you’ll find yourself coming back to time and again in pursuit of answers to questions or clarification of terminology or science. One of the most exciting aspects of digital technology is its revisability, and Dominy is taking full advantage of this by offering the reader a new edition at a preferred price every year beginning in May 2014. Later this month you’ll want to begin watching “Prospectors,” the nine-part series that premieres March 26 on The Weather Channel. 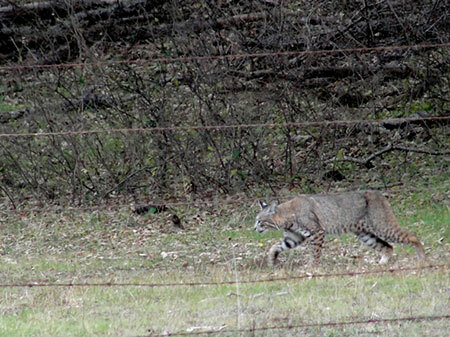 It follows Colorado gem mining families in the state’s mountains. (A second season already is being contemplated.) 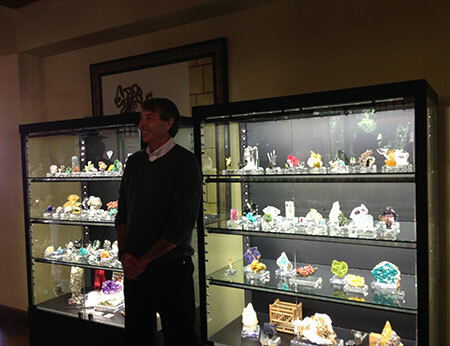 The series, produced by High Noon Entertainment, had its genesis when the company’s Scott Feeley shot video for the Denver Museum of Nature and Science regarding its famous “Diane’s Pocket” aquamarine, found in the Sawatch Range. 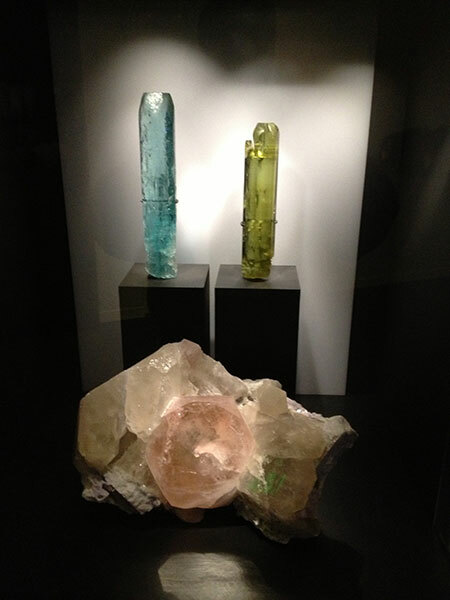 (See our “Record Aquamarine Specimen,” December 2006.) The locality in question, Colorado’s Mount Antero, features prime gem fields, as was mentioned in Sunday’s Denver Post. While High Noon has more than 25 shows in production, Feeley told the Post that “Prospectors” was shot in the “most extreme” location of their experience, filming at 13,000 feet. Weather, of course, also threatened to factor in. Streaming video attests to the challenges faced by the crew. 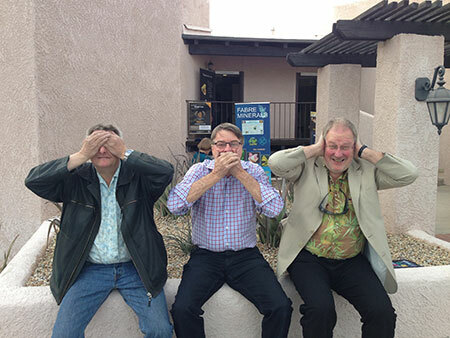 This month we feature some new purchases from the Tucson show. The first feature is a tsavorite from Eastern Africa. This tsavorite is a step above the average, with an ideal medium tone and super saturation. So often tsavorite is overly dark in tone when you get into larger sizes. This one really is the Goldilocks of tsavorites…just the right color coming to us just at the right time as tsavorite has seen an uptick in demand. 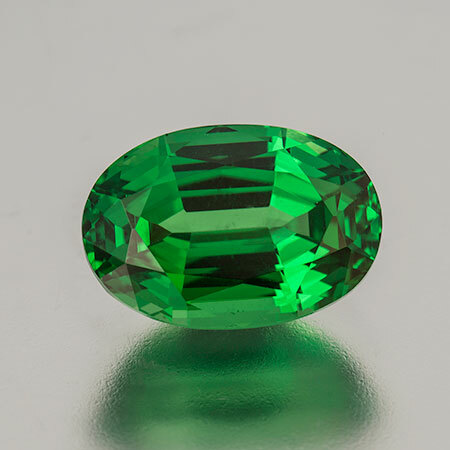 Tsavorites have a short history as a gem variety, only dating back to 1967 when the late Campbell Bridges discovered them in northern Tanzania. He later found them in southern Kenya in 1970, near Kenya’s Tsavo National Park, and coined the name tsavorite in 1974 along with Henry Platt of Tiffany & Co. This month’s second feature isn’t technically a faceted gem, but it certainly is a gem. We have seen rough diamond crystals popping up more and more in designer jewelry. These three unique gems would inspire design as well as entice the collector. The first one is a 9.04-carat octahedron from The Democratic Republic of Congo. It displays perfect octahedral form with etched faces full of trigons and terraces. This crystal is a grayish white with no damage and good translucency. The second diamond is an unusual 7.8-carat double yellow macle from Russia, with an unusual Christmas tree-like formation from two penetrating macles. The top faces are like windows, looking into a fairly clean core with some internal crystals. This diamond is a light yellow, with no damage and very lustrous. The third is an extremely rare 3.44-carat white macle from Canada. It features perfect macle form with etched faces. 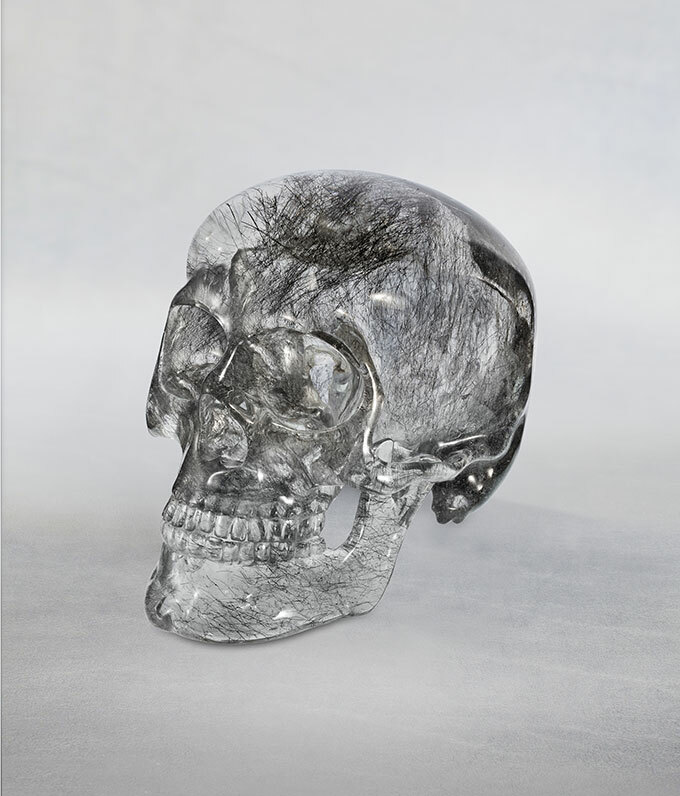 The crystal is colorless and nearly flawless, showing great transparency. No damage; just a pristine jewel. 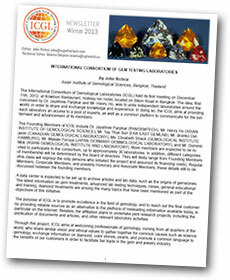 The ICGL has issued its first newsletter. Topics include identification of yellow sapphire, identification of diamond for synthetic origin, and a look at the Mandalay jade market. Last month we received a notice from Dr. Jayshree Panjikar, of Pangem Testing Laboratory, about a new laboratory initiative that she has co-founded with six other labs. 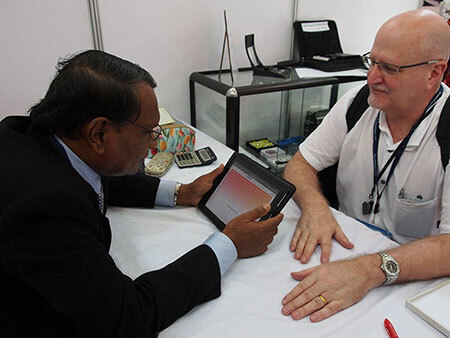 The International Consortium of Gem Testing Laboratories was established in December 2012 at the initiative of Dr. Panjikar and Henry Ho, of the Asian Institute of Gemological Sciences. They look forward to about thirty member labs from around the globe. Aims of the organization, according to a press release, are: unification of independent labs worldwide, sharing of knowledge and experience, and providing access to a pool of experts as well as a common platform for communication. Plans include a data center to collect articles and lab data on gem treatments, advanced lab testing techniques, mines, education, and diamond treatments. Joint research projects will lead to publication efforts. 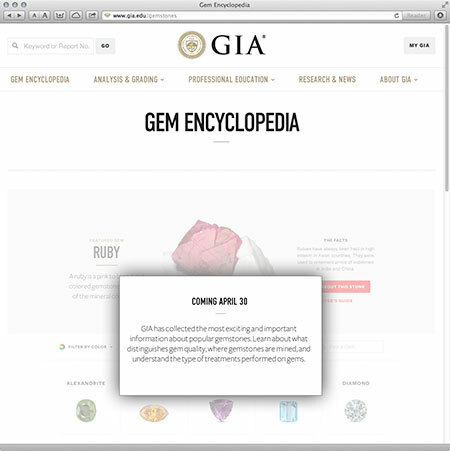 GIA announced on February 28 that its website and gemstone reports would get a makeover. Last week, the scheduled mid-March rollout hit a snag, due to security issues with the reports, which clients will be able to access securely online. The website is to feature “photography from GIA’s unparalleled collection of historic and contemporary images of gems and jewelry” and “will deliver timely and engaging information for visitors of every interest level.” Archival information is to be added later in the spring. 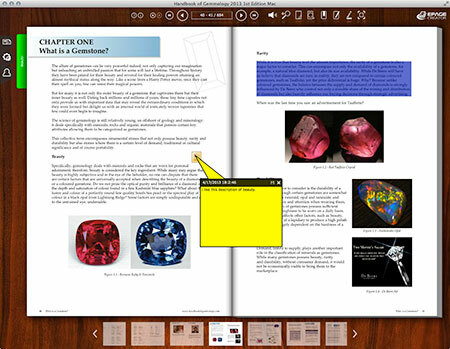 For instance, due to debut on April 30 are a Gem Encyclopedia as well as a Research & News section that will feature a desktop version of the journal Gems & Gemology. The Laboratoire Français de Gemmologie (LFG) website, while in the French language, nevertheless has at least three items of interest to speakers of other languages, thanks to online translation options. “Study of a ‘secret optical jewel’ to the LFG/ [P]hoto-microscopique jewel of René Dagron” is how Microsoft Translator rendered a title that originally appeared in the Revue de l’Association Française de Gemmologie (No. 180, June 2012). Building upon the invention of microfilm by John Benjamin Dancer, René Dagron (1819–1900) obtained a patent in 1859 and a decade later published his 36-page tract (translated as) “Photomicroscopic cylinders mounted and non-mounted on jewels: Patents in France and abroad.” Dragon’s microfilms might have been considered only novelties if it weren’t for Prussia’s Siege of Paris (1870–1871). Carrier pigeons were employed to transport microfilm across the blockade. The jewel that came to LFG is an ovoid gold pendant, 18.9 x 10.1 x 9.8 mm, weighing 1.96 g. Two openings in the pendant allow light to pass, revealing the tiny portrait of a woman. After research, the woman was identified and the provenance of the pendant was determined. 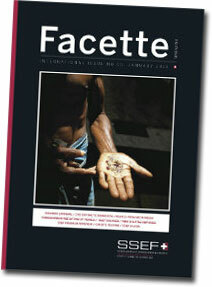 The Swiss Gemmological Institute SSEF has published its annual compendium of research and news, Facette No. 20. The lead article, by Dr. Michael Krzemnicki, is “Kashmir Sapphire,” in which are discussed the Kashmir “brand” and the related issue of the importance of origin determination, inclusions (illustrated), and chemical and spectroscopic properties. Dr. Krzemnicki spends some time comparing the “classic” source of Kashmir against Madagascar, and the nomenclature such as “Kashmir-type,” which is being used in some reports. 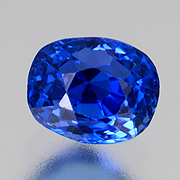 The lab received a “too good to be true” blue sapphire for inspection: it turned out to be cubic zirconia. Also through the lab doors was a purported Paraiba tourmaline necklace: some beads were tourmaline and others were polycrystalline lepidolite—still others were lepidolite featuring tourmaline intergrowths. 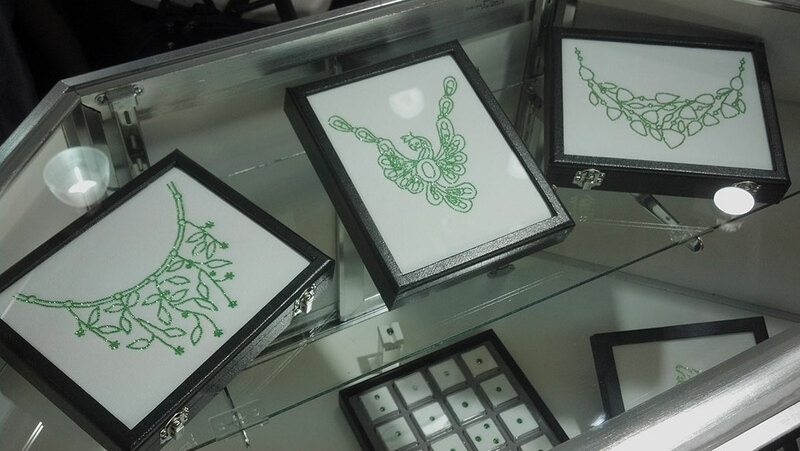 Other items of interest: dyed Ethiopian opal, a beautiful chrysoprase necklace, color-change zircon from Burma, and chemical vapor deposition (CVD) synthetic diamonds. One of the artifacts found in the wreckage is a cigarette-pack-sized crystal that has been studied for the last three years by researchers at the University of Rennes. The report of their study was published March 6 in the Proceedings of the Royal Society. 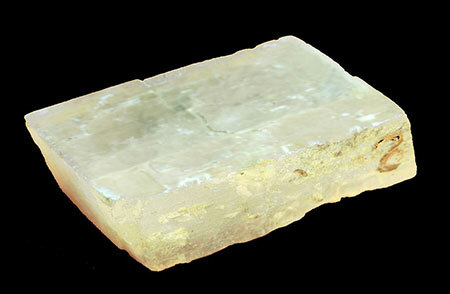 The authors conclude that “Alderney-like crystals could really have been used as an accurate optical sun compass as an aid to ancient navigation, when the Sun was hidden by clouds or below the horizon.” Our readers will remember our discussion of this material in the context of Viking navigation as well as the Alderney wreck in 2011 (see “Midnight Sunstone”). We demonstrate that the Ca2+–Mg2+ ion exchanges in such a crystal immersed in sea water play a crucial role by limiting the solubility, strengthening the mechanical properties of the calcite, while the sand abrasion alters the crystal by inducing roughness of its surface. 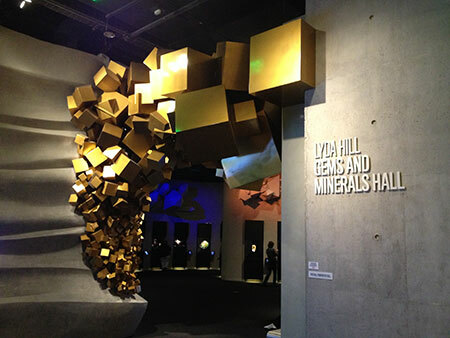 There are skeptics regarding the use of such crystals for navigation, such as Donna Heddle, director of the Center for Nordic Studies at the University of the Highlands and Islands in Scotland. 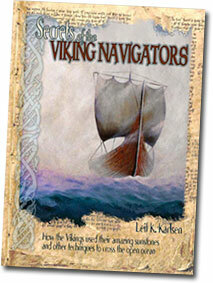 Quoted in The Vancouver Sun, Heddle felt that such things should be found in Viking graves. However, as noted in The Independent, Viking warriors were cremated, causing any crystals to shatter. 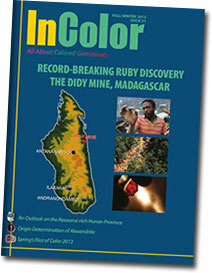 The Fall/Winter 2012 edition of InColor magazine has many articles of interest. One in particular focuses on efforts in Tanzania to benefit the communities surrounding the tanzanite mines of the Merelani Hills. The industry organization, Tanzanite Foundation, has built two local schools and supports another six, according to the article, “Tanzania: Ethical Initiatives and CSR Synergies.” As touted on the foundation’s website, the mining company TanzaniteOne pumps fresh water that serves 2000 villagers and 5000 cattle in the area surrounding the mines. A local orphanage provides education and housing to 400 children who have been orphaned or abandoned, largely by parents with AIDS. Local women last year were instructed by jewelry designer and carver Naomi Sarna in wire-wrap technique using lower-grade tanzanite, with the final product being sold in tourist shops. The foundation invited Sarna to the country to select a tanzanite crystal for carving, with the idea of it being sold to benefit the Masai people who live near the tanzanite mine. Because the government doesn’t allow rough larger than a gram to leave the country, the 200-gram crystal she selected (donated by the mine) was carved there. 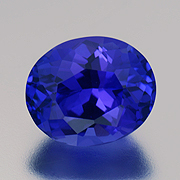 The result is a 725-carat carving (the largest ever in tanzanite), which will be sold. In 1796, Napoleon Bonaparte presented an engagement ring to Josephine de Beauharnais, widow of Alexandre de Beauharnais, who was guillotined during the Reign of Terror during the French Revolution. Josephine might have met a similar fate but the Terror ended five days later. As a widow she had affairs, including with Napoleon, whom she met in 1795. They were engaged in January 1796 and married on March 9, just two days before he, as General of the French army, left for an invasion of Italy. Alone again, Josephine’s eye wandered, as did Napoleon’s. Eventually she would be crowned Empress by Napoleon himself, as captured in the famous painting by Jacques-Louis David. But Emporers need heirs, and Josephine (a mother of two with Alexandre) was found wanting. Now, some 217 years after their marriage, the ring that Napolean gave Josephine is to be auctioned, along with a slew of other Napoleona, by Osenat in Fontainebleau. But it won’t be the centerpiece of the auction in terms of return. According to Osenat’s Jean-Christophe Chatagnier, Napolean was not wealthy. Chataignier told Agence France-Presse last month that Napolean’s lack of cash meant for a “very ordinary” ring. Chatagnier told Forbes over the weekend that the sapphire and diamond pear-shaped stones weigh approximately 1 carat each. More details on the March 24 sale are available at the Osenat website. The current AGTA Prism magazine (Volume 1 2013) cites a Bain & Company market study that sees “a strong men-ization of the market” over the past two years. 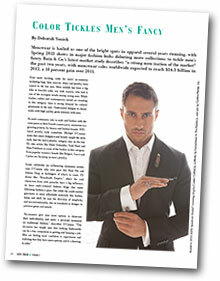 The story, by Deborah Yonick, states that the 2012 menswear sales worldwide would reach $34.3 billion, up 10% from 2011. Burma was slated to hold the country’s “first jewelry show organized by [the] private sector” on March 10, according to a short article March 3 by Eleven Media Group. It was to held at the office of Union of Myanmar Federation of Chambers of Commerce and Industry (UMFCCI) in Yangon. Meanwhile dealers in Mandalay’s gem and jade market petitioned the government against a planned move of the market to Myinmu village in Amarapura, from the current location in Mahar Aung Myay township, a 1.5-hour commute. According to Myanmar Times on February 25, the petition had received 2500 signatures in three days, out of an estimated 30–50,000 workers. U Than Htay, of the market’s social welfare group, claimed that the regional minister for forestry and mines, U Soe Myint, said the current venue looked like a vegetable market. The inference is that lower class sellers might be shoved aside in the prospective move. See more on the move in our November 2012 Burma Bits. Also see the newsletter of the International Consortium of Gemological Laboratories, above, for information about the Mandalay jade market. Burma’s Central Statistical Organization website has been down for some time, but Eleven Media Group (EMG) reported that Burma trade statistics for the current fiscal year, which ends at the end of this month, show an upturn over the same period (Apr–Feb) last year. This comes despite a drop in jade exports. The Burma government takes a hefty cut in legal sales of gems and jade. Enforcement is key, as was reported by EMG last week. From Nov–Feb of FY2012–13, the Border Trade Department collected 20.2 billion kyat ($2.5 million) for customs duty, compared with 5.3 billion kyat during the same period last year. This year seizures were made, whereas none were last year; the rate of seizure for jade and gems is less than on food and consumer goods. “Profit sharing” is what the huge tax on jade and gems is referred to in a February 20 Myanmar Times story. Under that system, the state takes 40% “share” of jade and gem revenue (30% for other sectors) and tops it with a tax of three to five percent. Minister of Parliament for Shan State, U Nay Win Tun, wants a change, claiming that entrepreneurs are forced to file “invented tonnage of minerals extracted,” since they can’t recoup their production costs. In other trade news, Burma’s Ministry of Mining announced it would issue new gem mining permits between February 18 and March 19 at 1 million kyat ($1,167) a pop, according to Mizzima News. The permit locations were to include Mogok. Of course, new mining of Mogok ruby won’t mean much in the U.S., where the gemstone still is banned. Well, Burma’s government isn’t taking that anymore: the government is going to lobby for repeal of that legislation. An EMG story on March 8 quoted deputy minister for foreign affairs Zin Yaw as saying that Burma would take one step at a time to counter sanctions, on both a political and legal basis. Indeed, sanctions now have become rather embarrassing given the fact that people like U.S. assistant secretary of state Jose Fernandez now are obligated to shake hands with people who are still on the blacklist. Bedfellows. 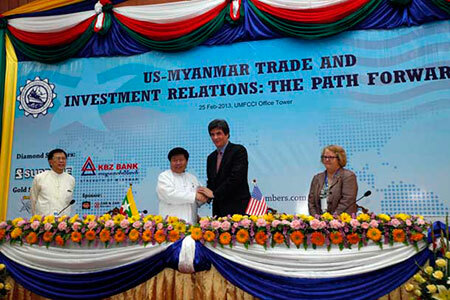 Jose Fernandez, right, shakes hands with Win Aung, president of the UMFCCI, at a February meeting with a 50-member U.S. business delegation. A memo of understanding was signed between the organization and the U.S. Chamber of Commerce, with the aim of promoting investment and economic cooperation between the two countries. Win took the opportunity to call on Washington to lift sanctions; technically, he is blacklisted himself. 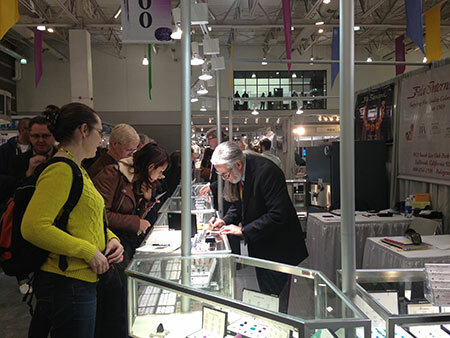 During the 2013 AGTA GemFair in Tucson, Renée Newmann’s twelfth book, Gold, Platinum, Palladium, Silver & Other Jewelry Metals, had its debut. It is a great book filled with details to help you evaluate, test, buy, sell and care for precious metals and alternative jewelry metals such as titanium, bronze and stainless steel. Renée always uses high-quality color photographs and does not disappoint yet again. Her way of writing makes it easy and fun to read. She begins the book by discussing the history of different precious metals, accompanied by beautiful photography. She follows up by showing us different manufacturing methods that have been used throughout time, and weighing in on their advantages and disadvantages. One section in the book discusses ways of testing a given metal to see if it is genuine or imitation; there are several methods you can do in your home with the help of simple tools. 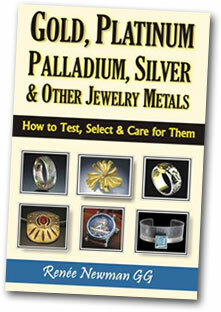 This is a superb go-to book of great value to anybody in the market of buying or caring for their jewelry! 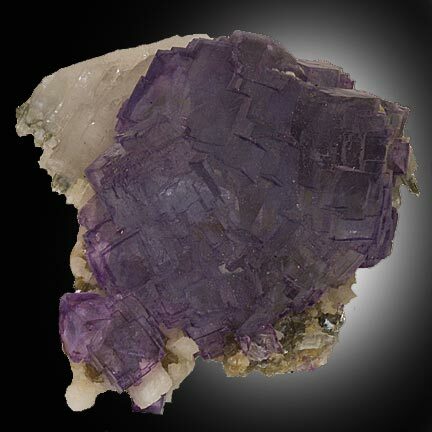 The present article, by George Frederick Kunz, on the variety of spodumene that later was to bear his name, was published in September 1903 in The American Journal of Science just after his shorter article, with the same title, appeared in the August 28 edition of Science. It was the latter article, as noted at the end of our earlier Pala Presents feature, “Spodumene from San Diego Co., California,” that Charles Baskerville referred to when he proposed, a week later in the pages of Science, that the variety of pink spodumene be named after Kunz. 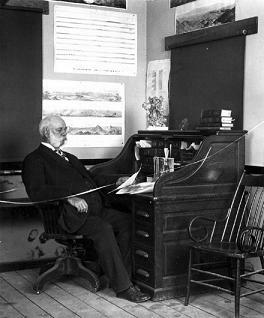 According to his Los Angeles Times obituary, Gilbert Ellis Bailey (1852–1924) was dean of the geology department of the University of Southern California. His father, Gilbert Stephen Bailey, D.D., was chaplain of the Illinois legislature when Abraham Lincoln was a House member, and the younger Bailey was born in a house that stood across the street from Lincoln’s. He matriculated at the University of Chicago and did graduate work at the University of Michigan before teaching at the University of Nebraska. As State Chemist he made the first analysis of sugar beets in the U.S. He was territorial geologist for Wyoming and later president of the School of Mines in Rapid City. In the 1890s he moved to California and was dean at USC for the 25 years before his death. Flux-Grown Synthetic Alexandrites from Creative Crystals Inc. 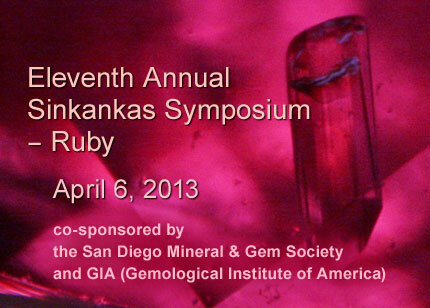 Regular Sinkankas Symposium contributor Dr. George Rossman, McMillan Professor of Mineralogy at Caltech, Pasadena, will discuss color in ruby and its relationship to the origin of color in the full range of various corundum gems. 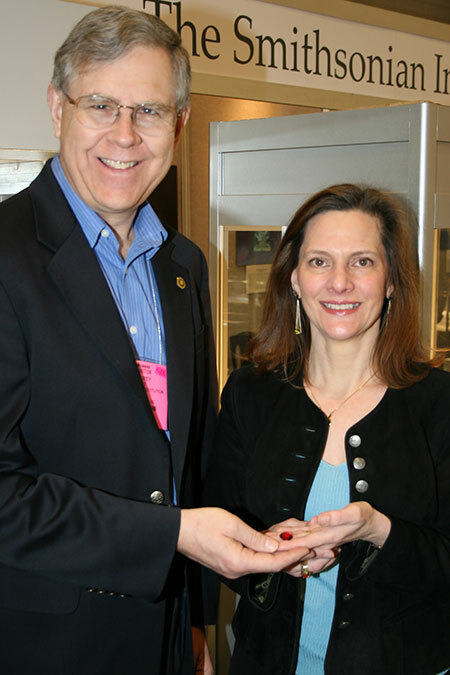 Pala International’s Bill Larson, no stranger to the Symposium dais, will present “Ruby Localities Shown in Brilliant Color,” drawing on over fifty years of traveling the globe in search of fine gems and minerals. Dr. George Harlow, Curator of Minerals and Gems in the Department of Earth & Planetary Sciences at the American Museum of Natural History, New York City, will discuss “Ruby from the Mogok Belt: Mineralogy and Geochemistry,” regarding the various processes affecting this unique locality. 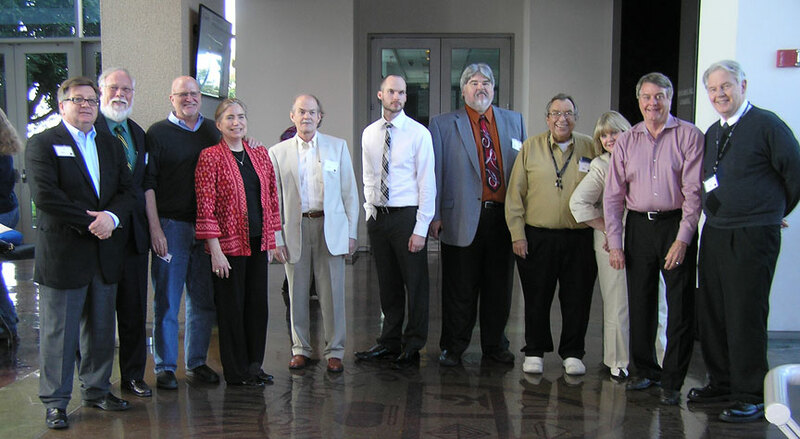 Distinguished Research Fellow at the GIA laboratory in Carlsbad, Dr. James E. Shigley returns to the Sinkankas Symposium for a third engagement, this time to discuss worldwide localities of ruby as well as the conditions and environments of its formation. GIA’s West Coast director of gem identification services, Shane F. McClure, will speak on “Enhancements to Rubies – both Natural and Synthetic,” an important topic in the gem trade. Nathan Renfro, who is Lead Analytical Specialist of colored stones at GIA as well as being a skilled lapidary artist, will present “Faceting Ruby: The implications for Optical Orientation on Color.” This year, Robert Weldon, Manager of Photography and Laboratory Publications at GIA, will present a personal historical narrative, “Trio of Ruby Tales,” illustrated with his beautiful photographic images. In the pink. 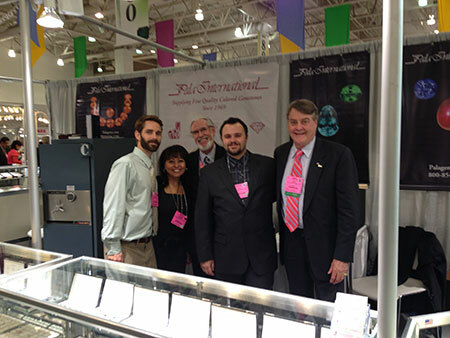 Members of the Pala crew step back from the counter long enough for a photo at the start of the GemFair. From left, Jason Stephenson, Gabrièl Mattice, Josh Hall, Will Larson and Bill Larson. 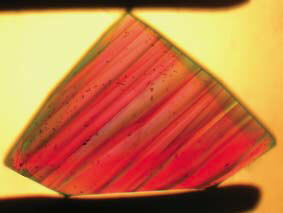 This month’s featured stone, without a doubt, has to be red beryl. With the gemstone portion of the Tucson Gem and Mineral Show just having been completed, we found that red beryl was the most sought-after and asked-for stone of our show. 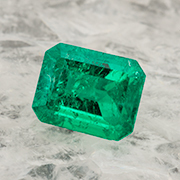 With only one recognized gem-producing locality—in the Wah Wah region of Utah—this bixbite variety of beryl is highly valued as a rare acquisition to gemstone collectors all over the world. 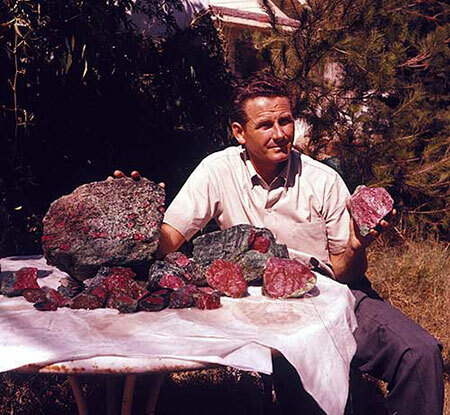 In 1904, red beryl first was discovered at Topaz Cove, Juab County, Utah; the material mostly was not gemmy. Maynard Bixby was the head of this early mining project and in honor of Mr. Bixby, red beryl’s mineral name “bixbite” was conferred (not to be confused with bixbyite, also named for Bixby). This discovery was the beginning of what would prove to be one of the most important finds in U.S. gem mining history. Although Hodges’s original desire was to prospect for uranium, he eventually deserted that plan, putting the Ruby Violet Claims project in its place. The discovery of gem-quality red beryl would launch this still relatively unknown variety of beryl on the road to legitimacy. This “red beryl” would forever stand in the “rare” category of “collection quality” gems and mineral specimens. In 1967, the Rex Harris family would purchase the mining rights. The paltry amount of $8,000 seemed like a lot of money then. The mining started slowly, then mechanization eventually had to be established. 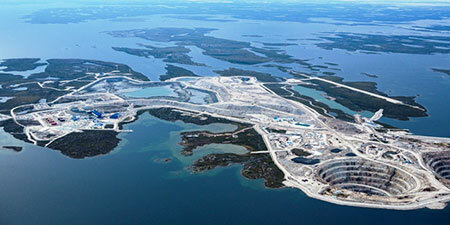 Eventually the mine would be functioning at full capacity, producing upwards of 1,500 tons of material per year. Rex’s daughter, Tina Nielson, states that the Harris family is in control of the only access and production available, and at present there is no material being commercially excavated for sale to the market due to negotiations in the works for the possible sale to a particular unnamed party. At the Tucson show this year, it was lovely revisiting red beryl with our established clients and other enthusiastic trade members. It was fun to see how many visitors wanted to view the beautiful samples of ruby-like material, with selected pieces resembling lovely Burmese ruby with its pink secondary. Interested in other stones like this? Due to a limited amount of material on the market, we cannot promise that this will be available. Call or email us to inquire. Peter Lyckberg was spotted promoting a labor of love that has occupied the last eight years by its author Peter Bancroft. 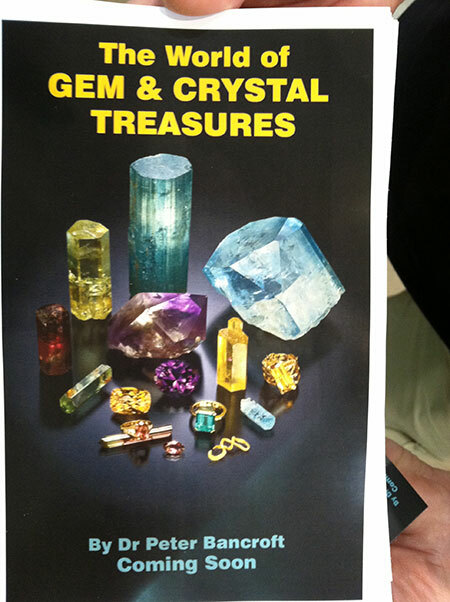 The World of Gem & Crystal Treasures, co-authored Lyckberg, is a follow-up to Bancroft’s classic Gem and Crystal Treasures, which was published in 1984. Many new gem and specimen mines have come into production since that time, and the new book will bring readers up to date. The book is slated to feature contributions by Pala’s Josh Hall, Bill Larson, and Jason Stephenson, as well as Rob Lavinsky, Bryan Lees and Daniel Trinchillo. These things don’t happen on their own, of course, and in the spirit of crowdfunding—or perhaps clusterfunding—sponsors are being offered the opportunity to contribute to the effort. Sponsors will receive leather-bound editions of the book, depending on level on contribution, and be acknowledged in the book. Contact Peter Lykberg for more information. 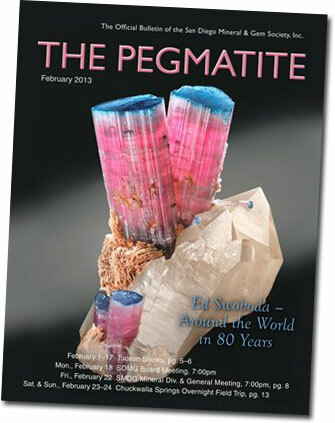 Bill Larson adapted his tribute to the late Edward Swoboda for the final all-color edition of The Pegmatite, the publication of the San Diego Mineral & Gem Society. Entitled “Ed Swoboda – Around the World in Eighty Years,” the article features the famous “Rabbit Ears” blue-cap photographed by Harold and Erica Van Pelt; it was Ed’s favorite specimen. You can obtain your own copy of the journal at the above link. In the 1970s, the flux process was applied to the growth of alexandrite by the forbears of Creative Crystals Inc., as is recounted in a new study of the material, “Flux-grown synthetic alexandrites from Creative Crystals Inc.,” by Dr. Karl Schmetzer, Dr. Heinz-Jürgen Bernhardt and Thomas Hainschwang in The Journal of Gemmology (33:1–4, 49–81). The authors begin the study acknowledging flux growth of chrysoberyl in the mid 19th century. In the 20th century, “modern synthesis” of chrysoberyl and alexandrite (chromium-bearing chrysoberyl) began in the 1960s. Fluxes (e.g., a mixture of lithium-molybdate and molybdenum-oxide) were annealed (heated to high temperature) and allowed to cool slowly. 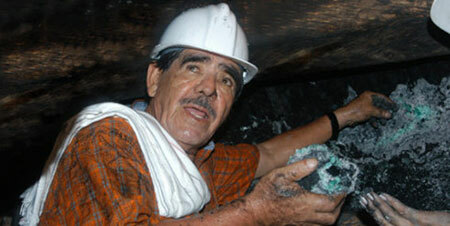 The slow cooling rate is necessary to obtain clean or almost clean (i.e., gem quality) crystals. While Chatham began marketing his emerald crystals in the 1950s, Creative Crystals Inc. (CCI) brought the first “commercially produced synthetic” alexandrites into the U.S. market in 1972. That same year, Richard Liddicoat wrote up the material in Gems & Gemology (14:4, 102–104), remarking on the hallmarks of flux synthesis as well as a “very attractive” appearance with a strong color change along the line of Russian alexandrites (as opposed to those of Sri Lanka). Dr. Schmetzer and his coauthors also cite a 1974 description by Wilhelm Friedrich Eppler in the Journal of the German Gemmological Society (23:4, 286–293). Other than general overviews of synthetic gems as a group, no subsequent, detailed studies of the Creative Crystals material have been published. That’s not to say that none exists: Dr. Schmetzer et al. point to what was until now the most detailed study of faceted CCI alexandrites, a 1989 unpublished diploma thesis by Angelika Pohl on natural and synthetic alexandrite, which was performed at the University of Heidelberg. In fact, Dr. Schmetzer was able to examine the same material as Pohl in the late 1980s, and—at that time—a correlation of all observed properties, especially microscopic features, with a particular growth process wasn’t possible. It was a challenge such as this that provided impetus to Dr. Schmetzer and coauthors to revisit this material. Another challenge, perhaps the most relevant to gemologists and jewelers, is the fact that, while the hallmarks of flux growth—residual flux, metallic particles (from crucible walls)—are detected easily, their absence is problematic: “faceted samples above 10 ct without any diagnostic inclusions are available,” as are included samples that mimic the genuine article. Our readers will recall Susan M. Neider’s close-call with a flawless 2.54-carat alexandrite in a Tiffany setting that seemed—and was—too good to be true. The more gemologically oriented of our readers will surely appreciate that the present study is the first to detail a gem material that was grown in a slow-cooling flux process in numerous growth cycles with the intention of bringing it to the commercial market. It builds upon Dr. Schmetzer’s experience studying natural alexandrites from different localities (see Schmetzer, K., 2010. 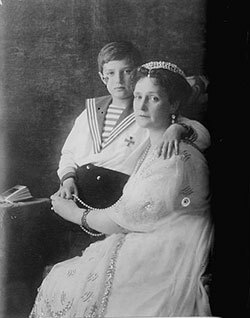 Russian alexandrites. Schweizerbart Science Publishers, Stuttgart, Germany, 141 pp. Schmetzer, K., 2011. Measurement and interpretation of growth patterns in chrysoberyl, including alexandrite. Journal of Gemmology, 32:5–8, 129–144). “Flux grown synthetic alexandrites from Creative Crystals Inc.” begins its experimental section with a description of the study samples, taken from several private and museum collections (e.g., GIA and Smithsonian collections) as well as that of CCI’s David Patterson, who provides a two-page sidebar describing the CCI flux-growth method. 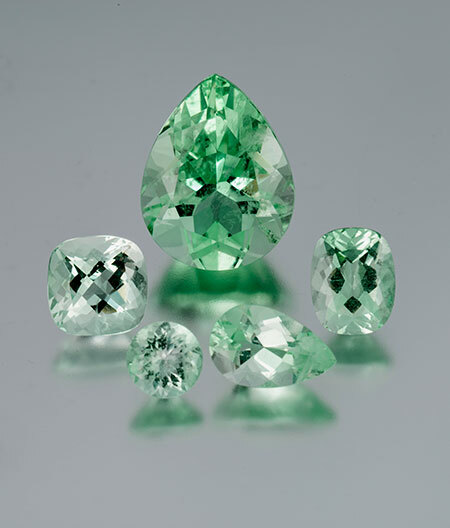 (The faceted alexandrites studied in the late 1980s were no longer available.) 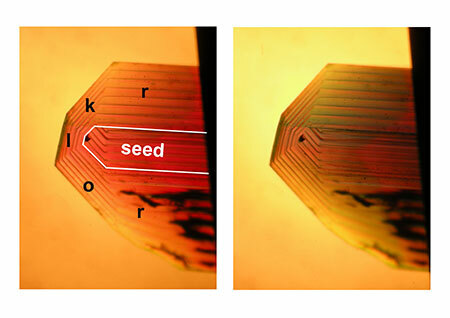 CCI used a seeding technique (immersion of a seed crystal in the flux solution), and three orientations were identified in the present study, as illustrated below. The study contains a detailed explanation of the seeding procedure, with diagrams and photomicrographs side-by-side to elucidate the text. Prior to the presentation of details of the seeding technique, however, the study contains a description of the morphology of the sample material. Five of seven crystal faces observed are common in alexandrites in nature from various localities. The dipyramid l is another, larger face seen in the synthetic material, having been described in the literature only as an accessorial face in a single Sri Lankan twinned chrysoberyl, to the authors’ knowledge. Next, microscopic growth features are covered for both crystals and faceted material. As one might expect, the seed orientation affects the internal growth patterns. Again, the study uses photomicrographs and diagrams to keep it understandable for the reader. Then, the study moves from growth zoning to color zoning—not unrelated, as three pages of excellent photomicrographs makes evident. Inclusions are handled next. Several photomicrographs display those common inclusions caused by residual flux, from the gossamer-like to the familiar oil-on-water-resist sort seen in flux-healed fractures in ruby. Less common are particles, needles and platelets of platinum (from the crucible). In one case, particles are trapped at the growth boundary. 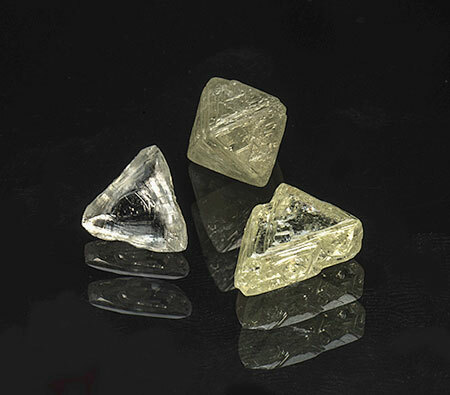 As alluded to above, the largest faceted sample studied was a 13.49-carat sample loaned from the Smithsonian Institution, containing none of these telltale clues. 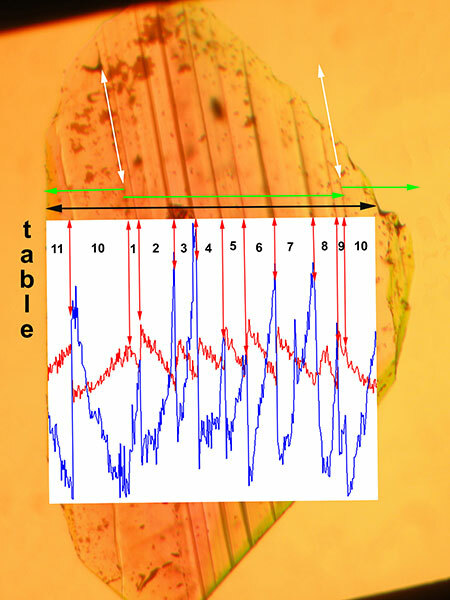 The samples were subjected to several laboratory tests, including X-ray fluorescence (revealing remnants of flux), electron microprobe (revealing variations in element concentrations within different growth layers), a detailed examination of chemical zoning of a faceted stone by a microprobe scan of about 400 analysis points across a single alexandrite sample (illustrated below), absorption spectroscopy (using a specially prepared and oriented alexandrite cube), and infrared spectroscopy (revealing a need for further study to understand all observed features). *The inset shows plots of chromium (red) superimposed over iron (blue) concentration measured by an electron microscope scan, about 2.3 mm long, consisting of 402 analysis points (black arrow). The study is rounded out with a discussion of the consequences of the applied growth technology, i.e., the process of “growing” a layer a week. It’s a fascinating chemical journey towards a completed crystal. Finally, comparison of the Creative Crystals Inc. material with that of Russian flux-grown alexandrites is undertaken. It is an interesting contrast, because the Russian method does not employ seeding. In “The Ownership of Words: An Essay on the Meaning of Padparadscha,” Richard W. Hughes begins by asking the obvious: Why is the term applied at all? 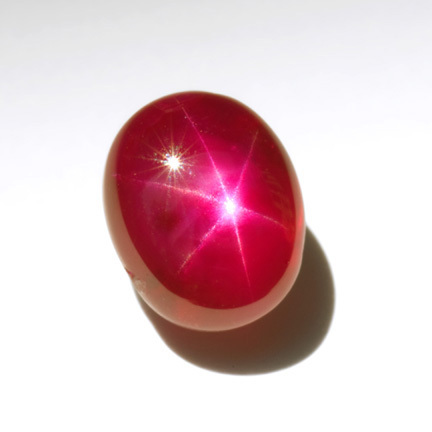 Padparadscha sapphire is, as Hughes explains, “a marriage between ruby and yellow sapphire.” But the term is a corruption of the Sanskrit/Singhalese padmaraga, or “lotus color”—i.e., pink tending toward red. Yes, you may find the odd exception, but “lotus color” does not conjure in the mind the subtle orangey-red that we associate with padparadscha. * And what about those associations, those assumptions? Hughes takes us through several references to the color, letting not-quite a hundred flowers bloom, but opening up the discussion nonetheless. Next, Hughes turns to what was to be a “tightening” of the color description, which leads to its own complications. Hughes then examines archetypal padparadscha stones—gorgeously reproduced in his essay—against industry color-chips created to standardize what is admittedly a subjective exercise. We’d say, “Surprise!” but then you’ve come to expect that from the keyboard of Hughes. Finally, last summer, Hughes conducted a survey of nine colored stone dealers in Sri Lanka and Hong Kong to obtain a real-world frame of reference. Surprise again: no Sri Lankans were asked their opinion when the industry standard was codified, and they had their own ideas about the application of padparadscha. Myanmar Times, also reporting on the 4th on the same topic, discussed Burma’s goals for MGE, according to vice-chair U San Myo: “establishing a gems and jade value-added market in Myanmar, improving the production and trading sector, and setting up a specialised gems and jade laboratory.” While foreigners cannot invest in Burma’s minerals, they are welcome to participate in growing a value-added market, according to MGE secretary U Kyaw Htay. Plans are in the works for a duty-free gems and jade market in the political capital of Nay Pyi Taw, called Shwe Kyar Bin. (Eleven Media Group reported on the 9th that such markets also would be set up in Mandalay and Yangon. See below for more on this.) The lab is due to be completed later this year. We should note here that the candor with which Myanmar Times reported this story stands in stark relief compared with a not-long-ago practice whereby the online journal was brought offline for breaches of de rigueur self-censorship. Indeed, a junta-era anti-dissent order (No. 2/88, as in the 1988 pro-democracy protests of August) was repealed late last month, as reported by the official Myanma Ahlin newspaper, according to Associated Press. The order banned public gatherings of six or more people, but its enforcement apparently had been lax of late, according to a BBC story the week before. BBC profiled the two “Iron Ladies” of Burma’s northwestern Sagaing Region—farmers’ daughters Aye Net and Thwe Thwe Win—who have mobilized thousands against expansion of a China-funded copper mine, which they say is ruining crops due to what we’ll call acid drain, or water that drains through the mine’s tailings. Last Thursday, the activists demanded punishment for officials who were behind a November 29 crackdown at the mine that allegedly included use of white phosphorus shells, according to AP. The “ban” story originally appeared in the “China Special” edition of M-ZINE+ on February 7.
ban the export of raw jade stone starting sometime this year. It was part of an alleged scheme to have the country’s new capital become the go-to place for stone-cutting and polishing, giving a desired value-added element to a very important export commodity. 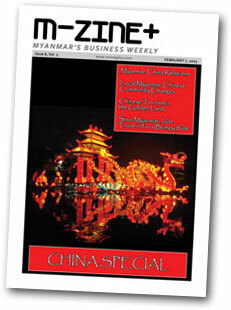 Myanmar Times reported on January 28 that gem and mining products for the 2012–13 fiscal year likely will be down 15% compared with 2011–12. Unfortunately access to Burma’s Central Statistical Organization has been unavailable to us for the last month. Sometime around the turn of the century, Tiffany & Co. published a slim volume on the subject of birthstones by its vice president, George Frederick Kunz. Natal Stones: Sentiments and Superstitions Associated with Precious Stones was perhaps a marketing ploy more than a work of scholarship. 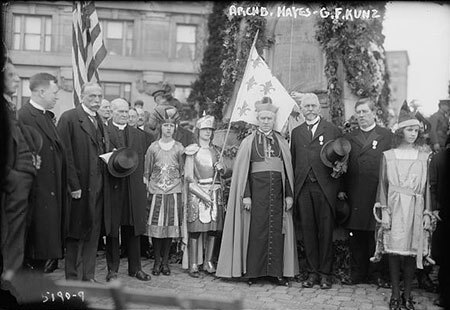 (Kunz would handle the latter in his Curious Lore of Precious Stones, in 1913.) In any case, the book was popular with the masses. It went into many editions (according to Library of Congress), enlarging from 30 pages in 1902 (the ninth edition) to as many as 40 in the 1920s (the twenty-sixth). 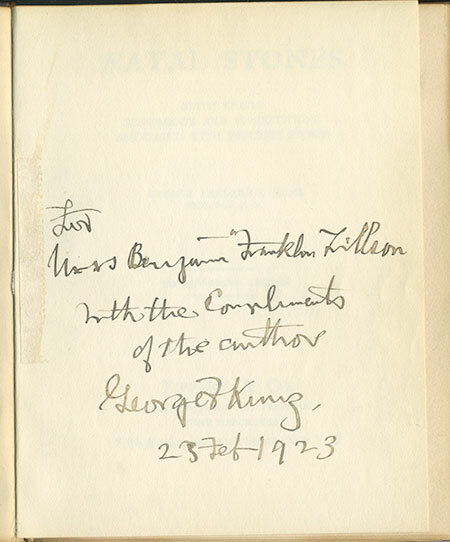 The copy in Bill Larson’s library is dedicated to “Mrs. Benjamin Franklin [Florence R.] Tillson.” In 1938, Mr. Tillson would author Mine Plant, on the design of mines, published by the American Institute of Mining, Metallurgical and Petroleum Engineers. 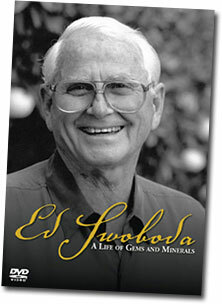 In this edition of our newsletter we remember Ed Swoboda. The late Ed Swoboda was last year’s Sunday evening presenter. The event was captured by BlueCap Productions. The Gem & Mineral Council of the Natural History Museum Los Angeles County will present a members-and-their-guests exclusive reception in conjunction with a temporary display of five natural fancy vivid color heart-shaped diamonds in custom jewelry. 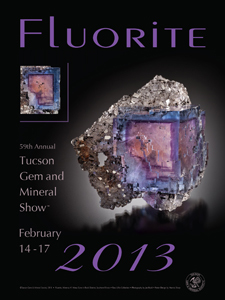 The reception takes place Friday, February 1, 3 to 9 p.m., in the Mineral Science Office. 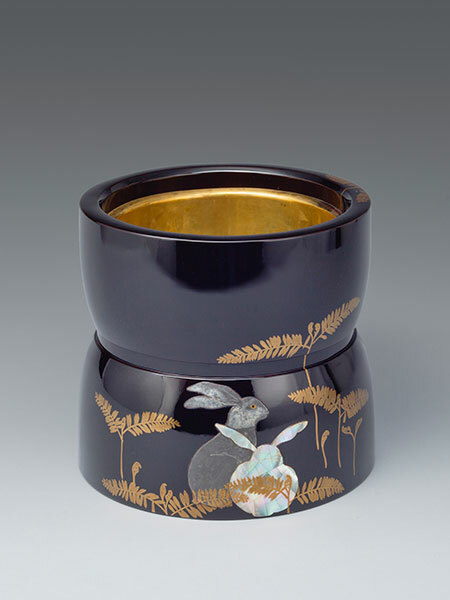 During the holidays at the Denver Art Museum, we stumbled upon a modest exhibition that revealed itself to be as exquisite as, well, a Japanese lacquer box. 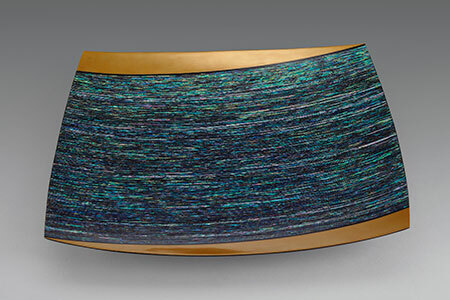 Meticulously curated by Ronald Otsuka, “All That Glistens” (not the “All That Glitters” exhibition of colored gemstones presented in San Diego) demonstrates, in the course of only thirty pieces, the breadth of artistry in 100 years of lacquer work. Represented are not only the trays, containers and chests that usually come to mind, but also plaques, screens, and even braziers—imagine actually committing to utility such a one as the hand-warmer pictured below. Several of the pieces employ precious metals, mother-of-pearl, abalone shell, and other materials familiar to jewelers. The center of the exhibition space is devoted to explaining the craft of lacquer, the refined oleoresin from trees, originally obtained from the “one hundred thousand” (Sanskrit: laksha) Lac insects that secrete their own resins. The lacquer, to which various pigments can be added, dries very hard, having been applied in layer after layer in a process that is specialized and time-consuming. Thus, many lacquer objects exhibit a lovely balance between lacquer’s durability and rigidity, and the delicate detail of figurative decoration. And then there are objects that, mm, break such typecasting, such as the tray pictured below. 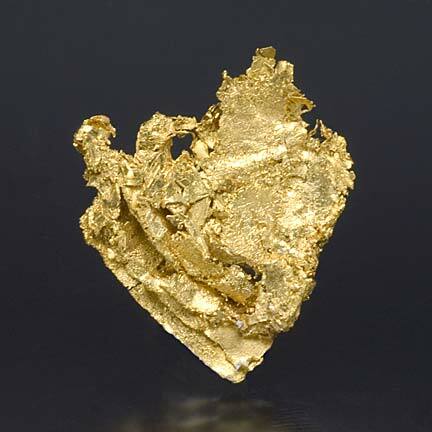 This month we feature a gem usually found on the mineral side of the business. Amazonite feldspar is found in many pegmatites around the globe, ideally showing beautiful prismatic bluish-green crystals. These amazonite crystals are almost always milky and opaque, but occasionally you find clean enough sections to facet. Amazonite is a gemological term that can apply to green and bluish-green feldspars. As a gemological term amazonite has been applied to green feldspars (both microcline and orthoclase) recognized since the early 1900s (Bauer: Precious stones..., 1904, L. J. Spencer translation). Pala acquired a rough parcel of some of these exceptional amazonites, and had them tested by Prof. George Rossman up at Caltech to make sure they were 100% natural. These gems were cut from a parcel that can be traced back to a gem pocket in Luc Yen, Vietnam. This pocket was uncovered in 1997 and contained many high quality tourmaline crystals along with some of these gemmy amazonite feldspars. 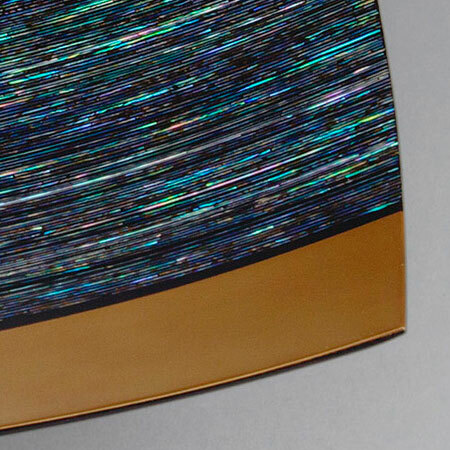 The color is reminiscent of neon-green paraiba tourmaline, showing fluorescent-like properties in daylight. This is fairly common mineral transformed into extremely rare and beautiful faceted gems. Along with his wife, Erica, Harold Van Pelt is best known as a photographer of fine gemstones and mineral specimens. Recent exposure has shone a light on Harold’s other area of artistry. 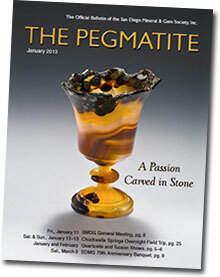 If an exhibition of his gemstone carvings at Southern California’s Bowers Museum—currently at the Houston Museum of Natural Science—left any viewers hungry for more, this month’s The Pegmatite, the bulletin of the San Diego Gem & Mineral Society, provides. In “A Private Passion Carved in Stone,” Pegmatite editor Lisbet Thoresen chronicles the very limited publicity that has been given to Van Pelt’s lapidary work, including mentions by the late John Sinkankas, himself a master carver. It was Sinkankas who taught Van Pelt—virtually—his craft and art. Intrigued? You’ll also want to see the master’s most recent work, unpublished until now on page 15, the carving of a foot in rutilated quartz—prickly, sparkler-y, superb. 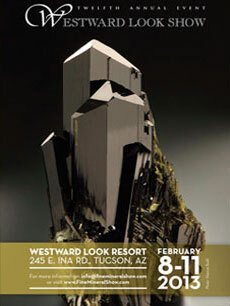 It will be exhibited at this year’s Tucson Gem and Mineral Show. Retired engineer Harold Killingback came late to gemology, receiving his FGA in 2002 from The Gemmological Association of Great Britain (Gem-A) at the age of 77. 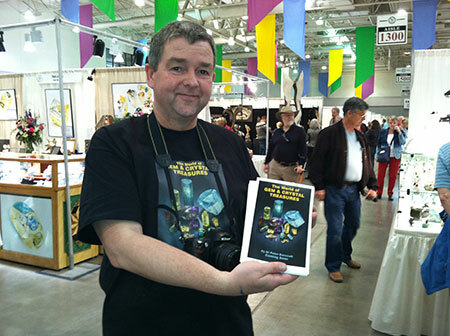 His work has been published in the pages of Gem-A’s Gems and Jewellery and The Journal of Gemmology. The former publication features an article not on asterism, a subject of which Killingback is fond, but on microscope lighting. I have made a device for lighting specimens on my gemmological microscope. It consists of twelve high-intensity white LEDs clamped in a circle between a steel washer and a transparent plastic base. The latter carries guides so that the centre of the washer is constrained to coincide with the optic axis of the microscope. A lead is taken from each LED to a 12-pole rotary switch (see the wires with red insulating sleeves in the photo). The switch is mounted on a control panel, under which is a battery and a holder for a current limiting resistor. The specimen can be viewed with side light from any angle, from 1 o’clock to 12 o’clock, without changing its position, a great help when studying the topography of an inclusion. This method is intended as additional to the normal bright field, dark field and top lighting, not as an alternative. 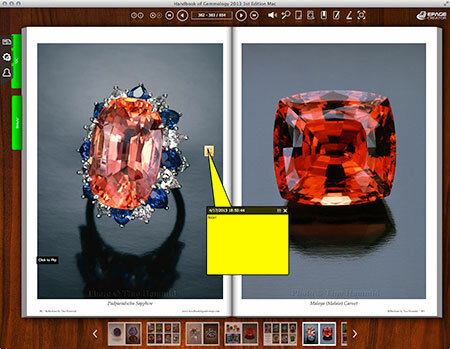 The idea is more fully described in “Making Light Work,” Gems & Jewellery, Winter 2012, Vol. 21, No. 4. 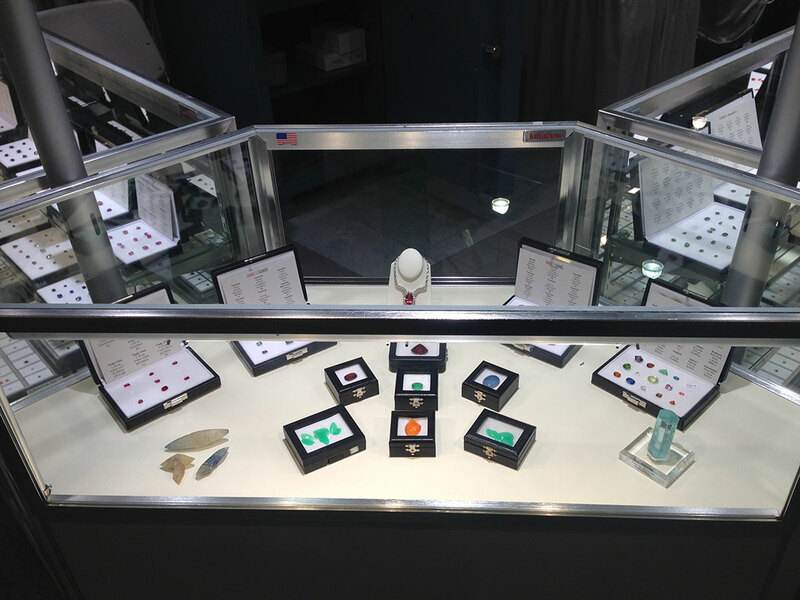 More information about Gems & Jewellery is available here. In his “Stone Scoop” column, Jack Ogden reported on a 2012 Gem-A board meeting at which the members spent quite some time in negotiation on whether the redundant “m” in the British spelling of “gemmology” might not be dropped. (Just today, while composing the above story on microscope lighting, we caught ourselves dropping in a third “m” for good measure.) It seems that protracted debate centered (or is that centred?) on just which of the two “m”s might be given the heave-ho. The final decision? You’ll just have to ask a Gem-A member. 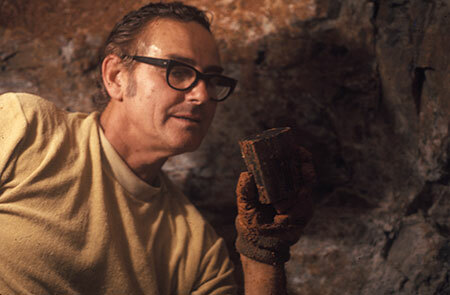 Edward Swoboda with a new find at the Tourmaline Queen Mine, 1971. 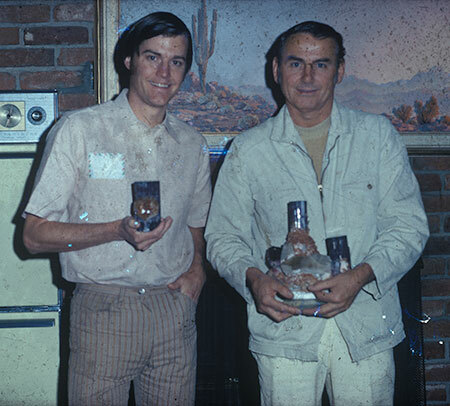 Edward Swoboda, right, with Bill Larson in 1972, holding two of the famous blue-cap tourmaline specimens, in a slide that looks like it had been left in an outbuilding at the Tourmaline Queen. See last month’s Pala Mineralis, which points to a reprint of Bill’s 1972 Lapidary Journal article about the original blue-cap finds. A little bird told us that Richard Russell, of Dow Theory Letters, in a January 4 missive, wrote something along these lines: Sophisticated capital has a tendency to lead markets, not follow them. Russell hears that big money is putting its cash into objects—the rare, the unique. That includes gem quality colored gemstones commanding prices that astonish most experts. At the time that we purchased the Harry Winston brand, resource investment opportunities for diamonds were rare and expensive following the euphoria of the Canadian diamond discoveries, and the involvement of the large international mining companies. The Harry Winston brand was competitively priced compared with its peers and we could bring diamond expertise and strategic connections to enhance value. Today there is a range of diamond resource opportunities while the value of heritage luxury brands has increased dramatically. This transaction represents a sound return on our original investment. It will leave us well equipped to realize upstream opportunities in an environment where cash has become a strategic resource while preserving and expanding our relationship with the downstream diamond business. The Harry Winston Diamond Corporation will continue to supply Swatch with diamonds but will trade under a new name, Dominion Diamond Corporation. On January 15, the Corporation announced that the Diavik Diamond Mine (in which it holds 40% interest) realized a 16% increase in carats produced during the last quarter of 2012. For calendar year 2012, the increase was 7%. An Associated Press article last weekend, dealing with the perennial conflict in Kashmir between Pakistan and India, stated that the countries are seeking to “ease tension” in their relations. While local press has fanned flames regarding the situation in Kashmir, even Islamic hardliners who oppose a softening in relations have been “muted” in their response, according to the report. Why? “Pakistan desperately wants increased trade with India to help turn around its stuttering economy.” Ditto for India. 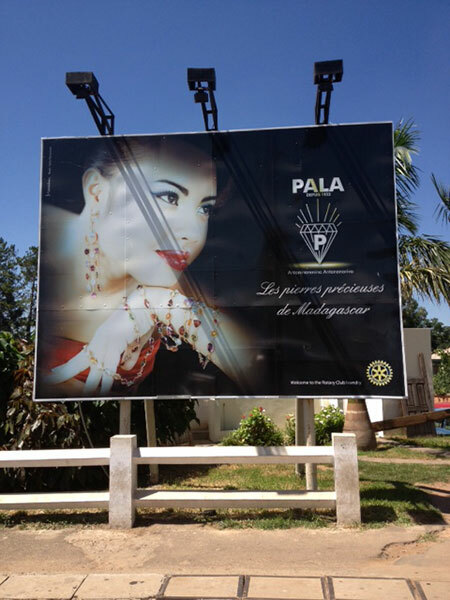 Pakistan’s gem and jewelry players already understand the importance of such cross-border relations. For some time, the Pakistan Gems and Jewellery Development Company (PGJDC), which will have a presence at the Tucson show again this year, has participated in the Indian International Jewellery Shows in Mumbai and Goa. An undated (2011) PGJDC newsletter talked of setting up a gems and jewelry training a processing center in Azad Jammu and Kashmir but the trade organization’s newly revamped website lists only five other such centers. 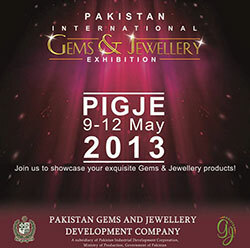 This month, PGJDC announced the Pakistan International Gems & Jewellery Exhibition, to be held May 9–12, 2013, in Karachi’s Pearl Continental Hotel. Today, The Irrawaddy reported that Burma’s president Thein Sein has repealed a law that in the past was used to jail dissidents for criticizing the government. This comes at the same time that the government is being faulted for an artillery attack on a border town in Kachin near the headquarters of the Kachin Independence Army (KIA). Hostilities between Burma’s army and KIA has caused the displacement of miners in Jade Land since a cease-fire fell apart 18 months ago. The clash has caused China to make noises about taking “measures to protect its frontier,” according to The Washington Post last Sunday. The formerly jailed Aung San Suu Kyi is herself under attack for a relative silence on ethnic issues—she finally called for an end to fighting in Kachin in an Irrawaddy interview yesterday—as well as for her National League for Democracy receiving monetary support from military-era jade-mining interests. Indeed, the Kachin conflict seems to have contributed to the dearth of large-scale gem sales in the last nine months. Into that void, it was announced early this month, enters a government plan to open a “gem industry hub,” as The Irrawaddy put it, in the political capital of Nay Pyi Taw. The plan calls for “91 plots for jade stores and jade industries” that would go for $375,000 a pop; 19 smaller plots would be sold for $263,000 apiece. The door appears to be ajar for foreign involvement. The story quotes a local gem dealer as saying that a previous attempt at such a venture failed—due to the lack of up-to-date technology needed for gemstone processing and creation of value-added products. Another industry-related effort was announced in mid-December: compliance with the Extractive Industry Transparency Initiative, a global standard that promotes revenue transparency, i.e., “monitoring and reconciling company payments and government revenues at the country level.” Later in the month, environmentalists themselves called for transparency in the course of natural resource exploitation, including gemstones.